The novelist looks back on an immigrant childhood. Gary Shteyngart is as much a New York media entity as he is a writer. Part Yakov Smirnoff, part Woody Allen, he's a literary showman like no other. He's a prolific blurber of others' books. A parade of Hollywood and publishing A-listers do cameos in trailers for Shteyngart's own work. Publishing today demands public engagement by authors like never before; the trouble comes when a reader must separate what's on the page from what's on YouTube. 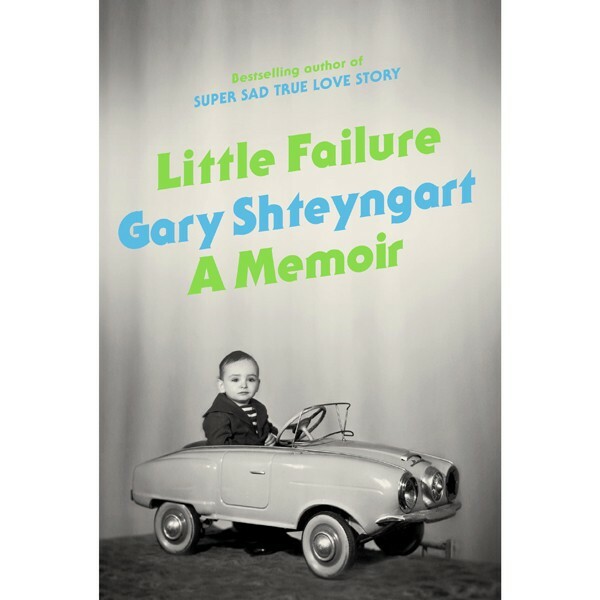 After three quasi-autobiographical/quasi-fabulist novels, Shteyngart brings questions of authenticity and artifice to the fore in a new memoir. The reader had no cause to wonder about the veracity of Shteyngart's plots when he set them in a fictional eastern European capital (his first book, The Russian Debutante's Handbook) or a dystopian future (his most recent, Super Sad True Love Story). But building a narrative from one's past is more fraught. How do you make the you in the book neither too villainous nor too heroic? How can you be fair to a subject you have no critical distance from? Little Failure begins with Shteyngart, a recent college grad, wandering into the Strand Bookstore Annex in New York City and being transported, via the photo book St. Petersburg: Architecture of the Tsars, back to his Leningrad youth. A sickly, asthmatic only child, he was the sad center of his parents' universe. Spending much of his time in the living room of their little apartment, on what he dubbed the Culture Couch, little Gary lived primarily through books and fantasy—like his fellow Soviet citizens, whose gray everyday existence demanded escape of one kind or another. Shteyngart's frailty sped the growth of his ever-expanding inner world, in which Lenin, his parents, cosmonauts, and heroes of his own invention were involved in an epic, never-ending battle for dominion over his heart. Raised with a combination of smothering attention and withering insult—familiar to anyone who has spent any time among the Soviet Jewry—Shteyngart as a child was both smug and self-hating, and yearned for his parents' acceptance. His father, an athletic aspiring opera singer from a village outside Leningrad, was forced, like most Soviet Jews, into a profession he didn't choose. His mother was a pretty, exacting music teacher. The two were an unlikely match. The restrictions the USSR put on its Jewish citizens produced an angry, creatively thwarted generation, whose children were often made to bear the brunt of their bitterness and disappointment. Shteyngart describes this very well: "My parents' blood did not mix well within me." In 1979 the family immigrated to Queens, New York, by way of Vienna and Rome—the standard itinerary worked out by the U.S. and USSR to allow a portion of Soviet Jewry to leave in exchange for grain and other political considerations. My family was also among those fortunate enough to take advantage of this momentary thaw in the cold war and make our way west. I recognized much in this section from my own experience: The culture shock caused by sudden access to seemingly limitless amounts of consumer products. The double life split between school and home. The rabid Republicanism and extreme suspicion of anything that smacked of social engineering. The unquestioning love of Israel. Shteyngart charts his progress from Solomon Schecter Hebrew school in Queens, where he was a lonely outcast getting his first glimmer of literary success, to Stuyvesant High School in Manhattan, where he became a stoner burnout, to Oberlin College, where he found his first girlfriend and began on the path to a literary career. Pathos and comedy ensue at each stop. Shteyngart manages to be both the hero and the goat, never missing a chance to make himself seem pathetic in his efforts to endear himself to friends, girls, parental stand-ins, and, of course, his actual parents. After moving back to New York City after college, Shteyngart stumbled through several office jobs and girlfriends, started seeing a shrink, and eventually published his first novel. Seeing himself for the first time as something other than a failure, he gained some perspective on his relationship with his family. "I used to be more forthcoming with my father, and consequently, I used to hate him," he writes. But this revelation was bittersweet because its cost was the loss of the closeness he'd craved from his father his whole life. His salvation all along is writing. He claims he's never had writer's block: "Put me in front of a keyboard and I fill up the screen." This ability has brought him the attention, acclaim, and love that he's sought. This Shteyngart gets James Franco to play his boyfriend in a book promo; he's not an outsider any longer. He didn't get there the way his parents might have hoped for—the immigrant parents' doctor/lawyer/businessman dream—but he's unquestionably a success. "I want to be loved so badly, it verges on mild insanity," Shteyngart writes. There were points in Little Failure when I wished that he would ease up on the throttle a bit, not try to cram so many zingers, witticisms, and riffs onto every page. But this memoir gives a better picture of the man than his novels or many media performances have. His is a good story, at its best when the author stops jumping around and just tells it.